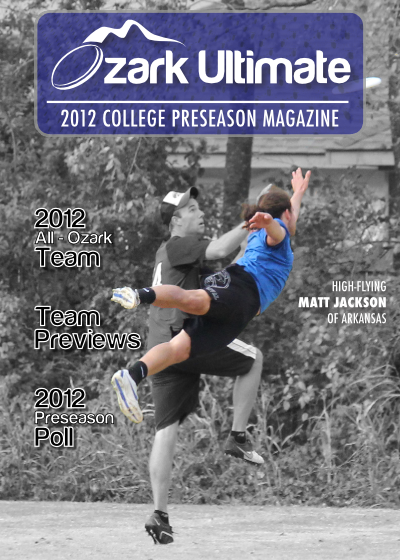 Arkansas’ Graduate Captain Matt Jackson and All-Ozark Player of the Year has been named a 2012 Callahan Top Ten Finalist.The award is the highest individual award in college ultimate. Rice upset Harding 13-10 in the Division III South Central Championship on Sunday. With the win Rice secures the lone bid to Division III Nationals. 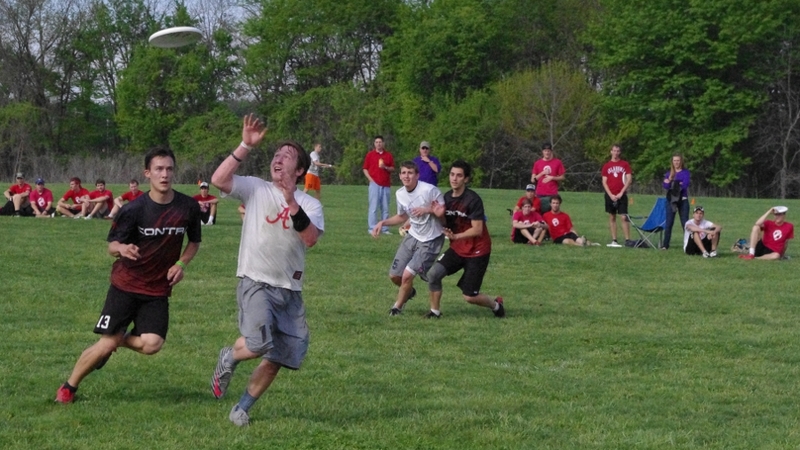 The Oklahoma Apes of Wrath barely held off a strong rally by Washington University’s Contra to win in the final round of pool play at the Ozark Conference Tournament, 11-10. The Apes looked to be in firm command of the game early on as they jumped out to a 4-1 lead and kept that advantage to a halftime score of 6-3. In the second half the Contra’s veteran leadership stepped up their game at the same time Oklahoma’s short bench and tired legs started to catch up with them. 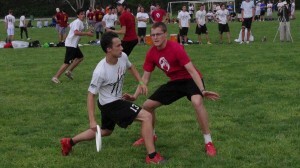 Led by Zach Lou and Luke Ding, Contra kept their hopes alive with several layouts on both sides of the disc. The tenacity on both sides of the disc allowed Washington to tie the game at eight all and Oklahoma appeared to be on the ropes. However, Oklahoma was able to barely hold it together and the two teams ended up trading downwind points to 10-10. With the game hard-capped, Oklahoma utilized a misstep in Contra’s switch d to easily score the game winning point. “We dug deep and found the desire to win in the end. You just have to find it in yourself,’ said Oklahoma captain Kevin Christian. 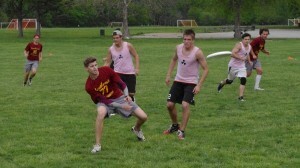 With the win Oklahoma takes second place in the B pool. The Missouri MUtants took down in-state rival Missouri State Bears during the fourth round of the Ozark Conference Tournament, defeating them 13-7. The MUtants jumped out to a 5-2 lead on the backs of their starters and then utilized their bench effectively to take half at 7-4. After half the Bears put together a 3-1 run of to bring the game within two at 9-7, and had a chance to cut the deficit to one but failed to do so. The MUtants would score the last three to win. Central Arkansas scored the first point of the game against Oklahoma State, but that would be the last time they would lead as Abduction was unable to probe a weakness in Ultimato’s stifling zone defense, falling 11-2. “The wind finally picked up and we were able to run our zone [defense]. Our zone has a calming effect on the team and that allowed us to get into a flow and limit our turnovers while generating some from [UCA],” said Oklahoma State captain Max Barowski. Central Arkansas gave Oklahoma State a game early on, keeping calm under the zone pressure. 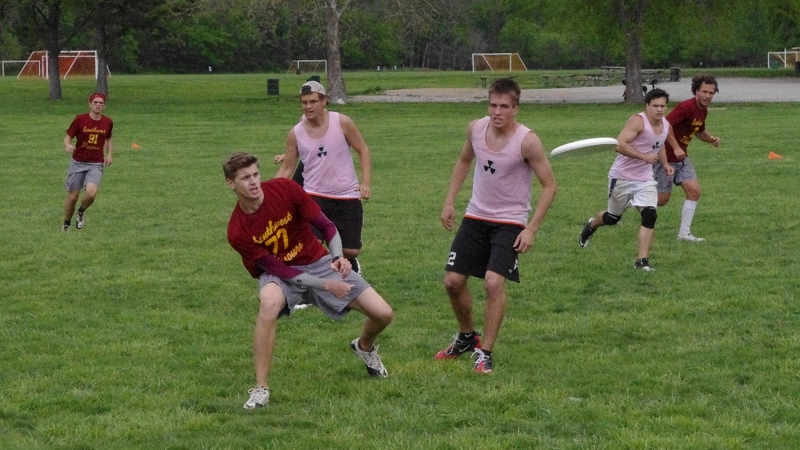 However, after scoring to make it 3-2 in Ultimato’s favor, Abduction began to force the disc through the cup — and that did not work. Oklahoma State took half at 6-2 and scored five in-a-row in the second half to finish the game on an 8-0 run. The Kansas HorrorZontals rallied from a five point second half deficit to stun Arkansas’ Ludicrous Speed, 13-10. “We got down big and tried to do too much at once. Once we started focusing on one point, one cut and one catch at a time we started taking care of business,” said Kansas captain Joe Young. Arkansas jumped out to a commanding 7-4 lead to take the first half on the back of several upwind breaks. After half Arkansas scored the first two points to make it 9-4, and then began to rest their starters. Kansas kept up the intensity though, taking advantage of Arkansas’ second line and quickly scored three straight, 9-7. Arkansas’ starters reentered the game but Kansas’ Frank Plummer Jr. hustled down field to get a layout d that both shocked Ludicrous Speed and fired up the Zontals. Kansas used the layout as a catalyst to score several more points without a single turnover over a stunned Arkansas to take an 11-9 lead. After a timeout, Arkansas calmed down and appeared as if they were going to score but turned it over just shy of scoring. 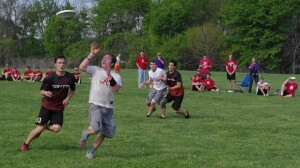 However, they got the disc back and caused Kansas to make its first turnover in seven points. 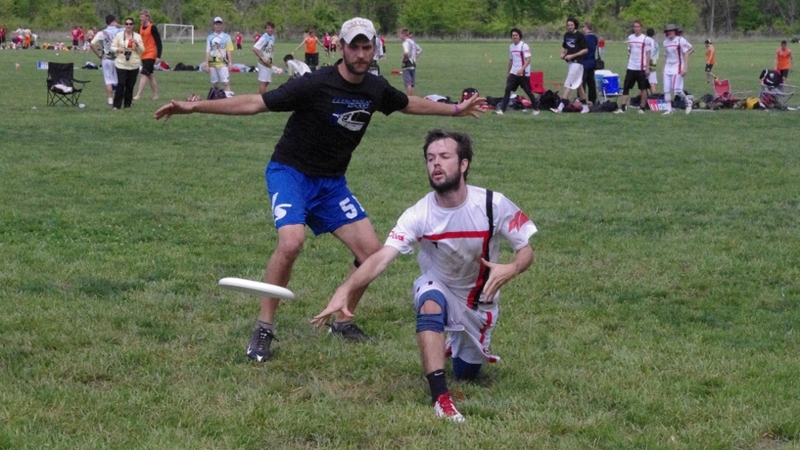 However, with Arkansas finally moving the disc, Plummer Jr. got another layout d and finished it with a sliding layout for a bookend point and make the lead 12-9. Arkansas would finally score on the next point to stop Kansas’ eight point run, but it was too-little too-late, as the Zontals answered to finish the game one point later. 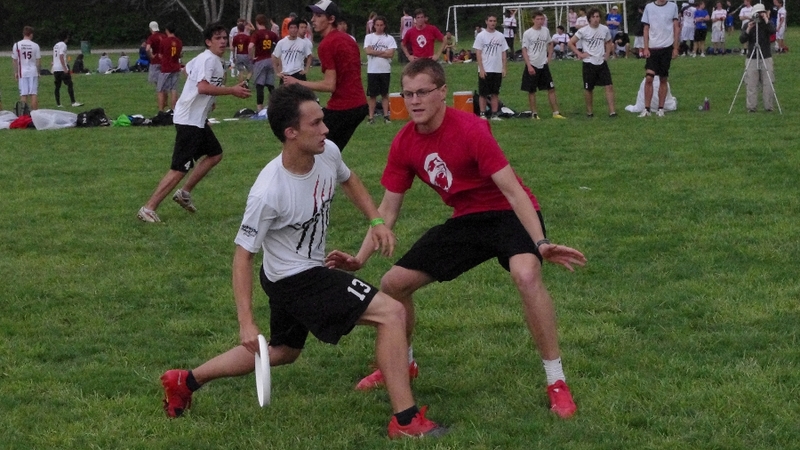 The Kansas State Huckstables utilized four foot-blocks on the mark to upset the number one seed Washington University Contra 11-7 in Pool-B at the Ozark Conference Tournament on Saturday. The game was a back and forth affair for much of the first half. The two teams traded points until Kansas State was finally able to get some separation from Washington University by getting a foot block. That turn allowed them to go up a break, 5-3, which they held onto until half at 6-4. After half, Contra scored the first two points to tie the game at sixes, but the Huckstables answered with a four point run brought on by another foot-block to make it 10-6. The teams traded points to finish the game. In addition to the four foot-blocks, the Kansas State defense recorded three other forced turns. It looks like the weather in the Kansas City area will be interesting to say the least for the 2012 Ozark Conference Tournament. With severe storms and strong winds predicted for the weekend, this tournament could be heavily influenced by the weather. Strong weather is nothing new for the Ozark Conference. 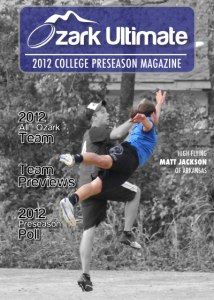 In 2004, the Ozark Conference Tournament was stopped in the final rounds due to lightning and high winds. The high winds later spawned a tornado in the nearby area. I was pretty fired up to see Huck Finn this year. Some of the national contenders from previous years were not going to be there, but Harding and a handful of other Ozark teams looked like they would put on an interesting show. Add in the wet fields from the week of rain and games were going to be downright exciting. Unfortunately, after arriving in St. Louis, this reporter got very ill and received a gift of feverish misery. What a shame that was, as there were upsets, head-scratchers, and crazy results all weekend long. Despite my illness the cameraman was still able to go tape the first few rounds to give a little insight into the events at Huck Finn. 1. Harding: Apocalypse is hitting its stride at just the right time. In their last three tournaments Harding has just three losses, and two of those are to Texas A&M. Returning all the big names has definitely helped them, but the bench is playing a bigger role than they did last year, and that has made a big difference. 2. Washington (St.L): Contra is out to prove that even without Winograd or MacDonald, though they may not be the undisputed best in the conference, they are still a force to be reckoned with. They’re already showing some of that; if they can bear down on teams, go for the kill, and not make so many mental mistakes, Contra could be walking away with another Ozark Conference Championship. 3. St. Louis: Sleeping in their own beds surely gave the Arch Angels a boost. Still, losing by two to Harding and beating Kansas on Sunday to make the semifinals is a solid showing that has more to do with skill than a good sleep. St. Louis has improved their turnover ratio from Free State and that has made a big difference. If they keep this up the Arch Angels may be showing some teams an unexpected exit at the conference tournament. 4. Kansas: The HorrorZontals are in a weird place right now. They have a talented team and solid coaching. Unlike last year they appear to have made strides in working together . However, Kansas still seems to have problems getting it going sometimes — especially on Sundays. That ugly fact reared its head once again as Kansas fell to St. Louis. The HorrorZontals are going to have to fix that if they want to return to their former glory. 5. Oklahoma State: You never know which Ultimato team is going to show up, literally or physically. Oklahoma State took rival Oklahoma to the brink, 14-16, at Big D, but they laid an egg at Huck Finn, finishing in the 19th place bracket. 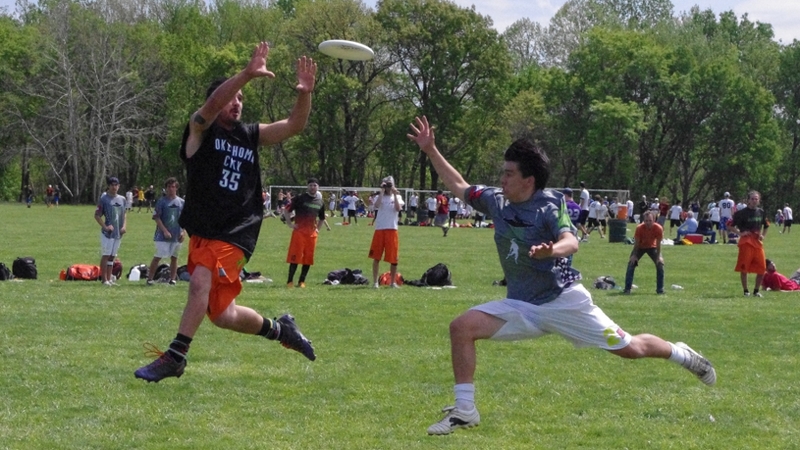 Ultimato did bring a small squad to Huck Finn and that did not help, but they need to turn things around next week at the Heart of Texas Huckfest if they do not want to be seeded in the basement at the Ozark Conference Tournament.